Of God's three aspects, His personal feature is the original and the only one with which we can have intimate exchanges. For hundreds of years, philosophers and theologians have debated whether God is ultimately personal or impersonal. After all, the nature of God plays a major role in our fate. If God is a person, then we have the potential for a loving, eternal relationship with Him. But if God isn't a person and is instead impersonal, like a light we merge into, then we miss out on the opportunity for such a relationship. In the opening article of the first issue of Back to Godhead, Śrīla Prabhupāda explains the purpose of his magazine. 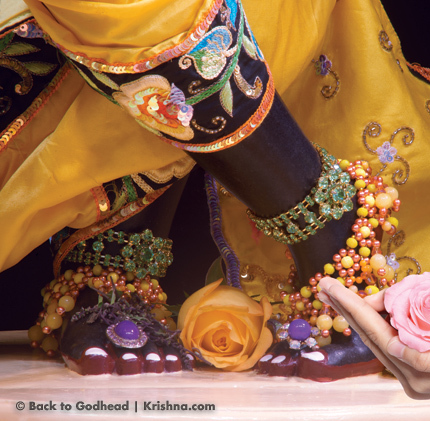 To commemorate the seventy-fifth anniversary of Back to Godhead, we present Srila Prabhupada's opening article of his first issue of the magazine, which he launched on the appearance day of his spiritual master in 1944. The world was at war, and Srila Prabhupada discusses that harsh reality in light of the purpose of the magazine. The Bhagavad-gita teaches that we cannot avoid old age, disease, or death. 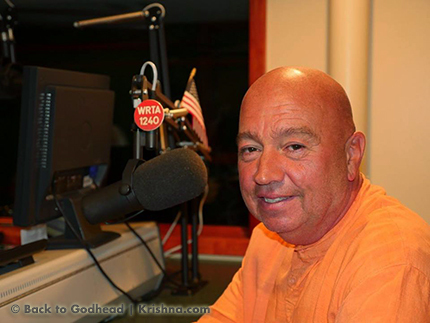 When Srila Prabhupada brought Krishna consciousness to America in 1965, his young disciples accepted the truth of this teaching. And as time has passed and devotees have aged, this teaching has become more relevant. 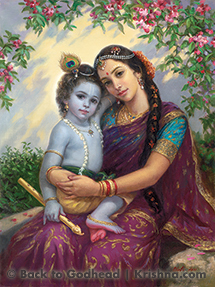 Gurudas, one of Prabhupada's earliest disciples, has spent his life in Krishna's service. When Srila Prabhupada arrived in America in 1965, he first stayed at the home of Gopal and Sally Agarwal in Butler, Pennsylvania. After a month he traveled to New York, where he opened the first storefront temple. Then he went on to establish a temple in San Francisco. I'm looking out my window at rounded mounds of snow piled against the tool shed. The winter British Columbia sky is gray, and pointy icicles are hanging from the edge of the roof. I'm warm and cozy inside our log cabin, and quite comfortable except for the swollen black eye I'm nursing. Let me tell you about the eye.